Pullbox Reviews – Justice League: Darkseid War: Shazam! Today, I’ll be reviewing a comic issue that pushes quite a few of my interests, including the character focus and the idea of mythology. Here comes Justice League: Darkseid War: Shazam!, in a story titled “Mightiest” written by Steve Orlando and drawn by Scott Kolins, including ideas from Jack Kirby’s Fourth World. 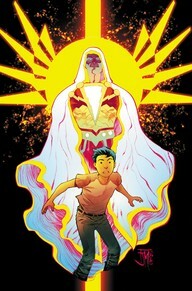 First, I’d like to congratulate Francis Manapul on the cover. It feels like an issue straight out of Jack Kirby crossed with a stained glass window, in a sense. Perfect for the New Gods and the Old. In the wake of the death of a certain New God in Justice League #44 (by Geoff Johns and Jason Fabok), the connection of the young William “Billy” Batson to his powers fluctuates briefly. In the chaos, the Wizard who gave him his powers (and seemed to die shortly afterwards) hastily gathered a new pantheon of six gods from disparate mythologies to replace his old powers, resulting in the briefly-depowered Shazam being titled the “God of Gods” alongside the other New God-powered individuals in the Justice League. He’s having trouble dealing with these new powers, having been thrown from the Seattle battlefield to Philadelphia by a portal. His new powers are unlike his old ones. There are six voices talking in his head, one of which is the Wizard himself. He can’t fly anymore, but has gained the ability to cast fire from his hands. In his panic, we learn that having new gods does not just mean he has higher power usage, but rather means that he has completely different powers altogether. For sake of understanding, I’ll analyze his original state (as he learns about it) in one paragraph, then his new ones one paragraph at a time. All the better to explain the situation. As explained by his first stop on his trip, Billy’s original powers were not known as the Power of Shazam for no reason. Just as before the New 52, when he was known as Captain Marvel, he takes his powers from six beings from the Greek and Judeo-Christian mythologies: the wisdom of Solomon, the strength of Hercules, the stamina of Atlas, the power of Zeus, the courage of Achilles, and the speed of Mercury. As for why he was not identified as this before, the easy solution to that problem is that the Wizard was in a hurry and had no time to explain the powers in full, but if this is just a case of retroactive continuity, I’m totally fine with it. Does this mean that Black Adam will change his powers to those of the Egyptian deities Shu (stamina), Heru (swiftness), Amon (strength), Zehuti (wisdom), Aton (power), and Mehen (courage)? Only time will tell. Now, on to the new pantheon. These will be discussed in order of appearance, rather than in order of the names. First, we have Anapel, brought into the dealings of Shazam for her compassion. She is very kind to Billy, and explains his situation to him, both prior and currently. Her discussions will cover another subject, however, so I’ll bring that up below. In real-life mythologies, Anapel is the goddess of reincarnation and birth worshipped by the Koryak people of Siberia, Russia, and her name actually means “little grandmother” in their language, fitting with how she behaves. Second, we have S’ivaa, for his strength. He is known as S’ivaa the Destroyer, one of the Old Gods who fell to give way to the New, and he hails from the land known as “Urgrund.” His manner of talking to Billy leaves a lot to be desired, treating him as a complete weakling (which, truth be told, Billy probably is in his child body that he uses when talking to these gods), though perhaps he intended for Billy to lash out at him verbally to prepare him for the next god. S’ivaa is one of the few New Gods that are not a part of any real-life mythology, having been created as a part of the Third World of Old Gods. Third, we have Ate, providing her boldness as the goddess of impulse. While she’s less abrasive than S’ivaa, she still puts a lot of emphasis on the idea that Billy’s situation is rather hopeless, which doesn’t do much to instill trust in the boy. Ate, or rather Atë, is known in Greek Mythology as the goddess of mischief, delusion, ruin, and folly, and is often the daughter of either Zeus, king of the gods, or Eris, goddess of strife. I suppose that the idea of impulsiveness, of boldness, is similar enough to the more common attributes, and it is not as if she would outright tell him what she truly is in charge of if she were of those things in the first place. Fourth is H’ronmeer, providing his fires (hence the fire manipulation). H’ronmeer has shown up before in DC Comics, but not as an Old God or a New God. Instead, he was the god of fire, death, art, and love of the people of “Ma’aleca’andra,” better known to anyone else as the Martians. Here, he keeps the domains of fire, death, and art, but there is no mention of love. He is again very abrasive toward Billy, saying up front that he considers Shazam to be little more than a vessel for the might of his patron gods. The honor (as reluctant as he is to take it) of being the fifth member goes to the Wizard himself, who reveals his true name: Mamaragan, who identifies himself as “a thunder god of the dreamtime” who was led abroad by his “songline” to join the Circle of Eternity in the first place. The fact that he is identified as connected to thunder makes a lot of sense, as with the connections between thunder and lightning, it lends a lot to how electricity is related to the most common use of Shazam. Mamaragan is not an original god, but rather an Aboriginal one, with much the same associations as his comic counterpart, including his use of lightning. Sixth is the evil who the various gods of this issue implore Billy to fight in order to keep the Staff of Living Lightning, a means of controlling the lightning of Shazam (and thus its related gods), away from. His name is Zonuz, and he is the primordial god of evil, identified by Anapel as “suffering itself.” Long-time comic readers will recognize him by his assumed name, which was formerly his true one: Yuga Khan, the father of Darkseid, prior user of the Torment Sanction (likely the same as the Omega Sanction of Darkseid’s Omega Beams) and the previous god of Apokalips. His power is not given willingly, but rather is utilized after defeating him and rendering him likely comatose. For his part, the Z of the new Shazam provides Source manipulation, a power that has yet to be truly explained, but likely involves general use of magic. Yuga Khan was another of the original gods, this one created as a part of the Third World as well, and is so evil that even Darkseid shows fear of him. The use of the gods also makes a lot more sense of how the New Gods and the Wizard had been used so far in the New 52. According to Mamaragan, gods don’t actually die. They instead are sent back to the Source, where they collect themselves before returning. This both explains the Wizard’s own return and that of Yuga Khan, not to mention a certain other death from Justice League #44, but makes me wonder how the situation of the war itself will be solved. On the whole, great issue that included a lot of work with many different gods, something that I like as a mythology fan. Looking forward to the remaining one-shot with Lex Luthor (which this issue gave some worry over).